It's almost Summer! Are we going for a walk? Are you throwing a party? Modgy has a couple of products that can help. It's happened to all of us at least once, we go for walk, start panting, look for a puddle to drink, and our humans pull us away from the puddle. Mom thinks there are dangerous things like oil in road puddles. Eventually, our humans learn to carry a bottle of water for us. Then they realize that they only have their hands to pour the water into. BOL!! Okay, by now your human has learned to carry a bottle of water, and a bowl. Can you guess what I'm going to bark next? Squirrel! Yes! There is a squirrel to chase! BOL!! This is usually when humans start to wish that they had more than 2 hands. BOL! This is where Modgy's H2Fido comes in handy. H2Fido is a collapsible water bottle and bowl set that can be attached to almost any strap using a carabiner. Mom usually hangs things on her belt using carabiners. H2Fido is available in a variety of patterns. Modgy sent a Rainbow Rover H2Fido to me. I like the pretty colors on it. 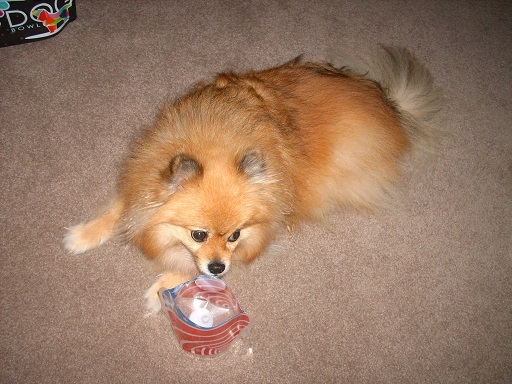 H2Fido is BPA free, reusable, and recyclable. Each H2Fido set includes one water bottle, 2 bowls, and a carabiner. Mom really likes that the carabiner hole on the water bottle is reinforced with a plastic ring. She won't need to worry about it tearing from the weight of the water. Food - You might get hungry and want a snack. 2 or more dogs - When they are all thirsty, a second bowl is very nice to have. If the first bowl gets dirty or torn - It's nice to have a spare one when you need it. 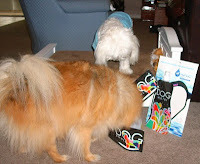 H2Fido bowls fold flat when empty, and have a zip seal on top. Your human can put your snack in one, zip it closed, and attach it to the carabiner. Now you're ready for a walk! Time to light up the party! 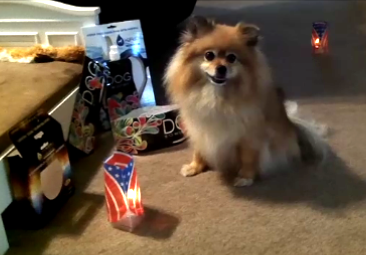 Modgy has a luminary that won't singe fur or whiskers. It is both pretty, and practical (as Mom would say - BOL!). Lumizu is a flameless luminary. 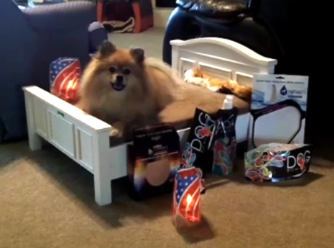 Now your humans can have luminary decorations, and pets at their party. You can wag your tail without getting burned, or starting a fire. Pawsome! Modgy has several designs of Lumizu. One of them is sure to coordinate with your party decor. 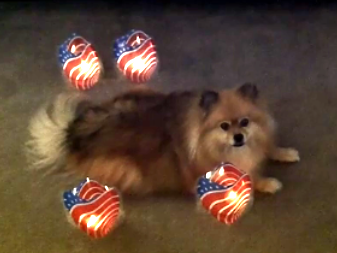 I am ready for the 4th of July with Modgy's Red, White, and You Lumizu pack. There are 4 luminaries in each pack. They fold flat for storage, are reusable, and recyclable. Lumizu make great centerpieces. They won't warm up any nearby drinks because they don't use a real candle. Humans seem to like cold drinks in Summer, but so do we. BOL! Lumizu is safe around pets, just don't eat them. I know that seems obvious, but I know some pups out there will eat anything. Mom is so lucky I'm not one of those. BOL!! I think she should give me a treat for not eating those kinds of things. 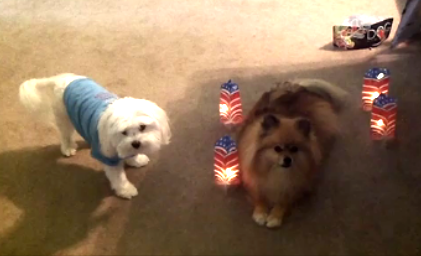 If you watch my short video, you'll see that Lumizu flicker like real candles. 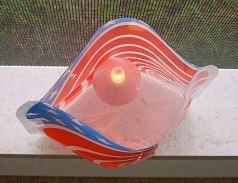 They are real easy to use: just open, add a few inches of water, and drop in the Lumizu "candle". The water turns the "candle" on. When you are finished using it, just take the "candle" out of the water to turn it off. If a Lumizu does get knocked over, it is easy to clean up with a paper napkin. There is no sand, glass, wax, or fire to worry about - just water. You can place Lumizu just about anywhere, even near curtains. You won't have to worry about flame or smoke damage. Lumizu won't pollute your lungs with smoke either. They are a great alternative for humans (and animals) with breathing issues. Ready for a giveaway? 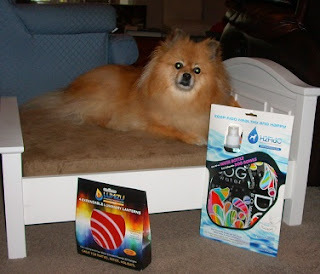 Modgy will send one winner a H2Fido, and one winner a Lumizu! Each winner will get to pick the design they want. Sign in to the Rafflecopter widget to enter the giveaway! Those are cool give-aways, Pepper! Good luck to everyfur! 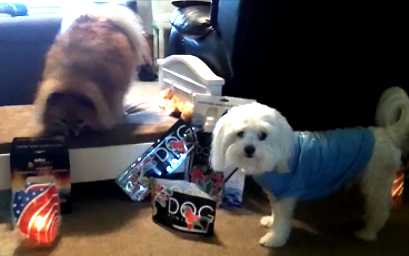 Pepper, you get your paws on the coolest stuff! The h2Fido would be perfect for my bike trips, my camping trips or just walking around South Florida during a hot summer day! Great review...as always, dear Pepper. Wow, these look awesome! We have some collapsible bowls but are always looking for new and innovative products! And the luminaries look great, too! So hard to choose...hope I win something! Either of these prizes would be great to win. I cannot decide which on I like better.